The coinciding of Mothering Sunday with Mother’s Day is an occasion of dread for many priests called to preach on this day. On one hand, there is a lot to celebrate with truly thankful and joyful hearts for the gift of motherhood. On the other hand, there must be sensitivity for those for who today will be a painful reminder of personal hurts – for children who have not received love from their mothers, to say the least; for women and couples unable to conceive; and for those who are mourning the loss of their mother-figures. Yet, I believe that if we follow the inspiration of the Scriptures presented in the lectionary we may be able to reflect together on a particular aspect of motherhood which is at the same time both a cause for thankful celebration and a sobering reminder about the reality of parenthood. This aspect of motherhood and motherly love is courage or fortitude – that virtue that allows us to persevere and act rightly in the face of uncertainty, pain, discouragement, and opposition. I our reading we find two examples of courageous mothers. The first one is found in Exodus in the mother of Moses, as she, defiant of any threat of capital punishment, chooses to keep and nurture her child, rather than to dispose of him at his birth like an unwanted thing. At the time the child is born the Egyptian authorities order that all Jewish male children have to be killed upon birth, but Moses’ mother prefers to risk her own life by giving her son the best possible chances of survival, rather than give in to the threats of the Egyptian law. Jochebed, as she is traditionally named, trusts in God with her life and the life of Moses, and her courage is the practical outworking of her trust. Indeed, as Jochebed sees that her plan has miraculously gone unexpectedly better than she would have ever thought and Moses is rescued from the waters, she again has occasion to show courage in her motherly love in a very self-giving way. Jochebed does not claim her maternal rights with Pharaoh’s daughter who saved the child, rather by keeping her identity hidden she is able to ensure that the child will live and prosper. Claiming the baby could have resulted in the murderous law being enforced, so the woman’s courage allows her to deny herself the usual motherly interaction with her son in order to be a true mother-figure to him, looking out for his best interest. In our gospel reading we are confronted by the second example of courage in the Blessed Virgin Mary as she stands beside her dying Son with a selected, courageous few. As Jesus hangs from the Cross, held up only by the nails which cut through his body in order to fasten it to the wood, everyone has left. All the disciples but the youngest are nowhere in sight; the soldiers who carried out the execution are busy gambling over Jesus’ clothes; even those who taunted him in his agony have gone away. 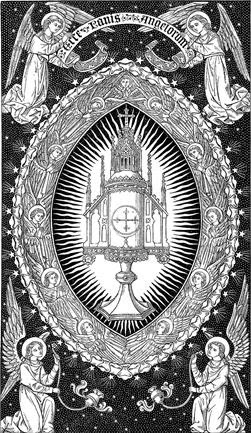 All that is left is a small company of people headed by Mary. It is in this place of death and desolation that the Virgin shows us once again her courage dictated by love for her Son. She had followed Jesus, maybe at a distance, for most of his life, and that love that prompted her to follow him then won’t allow her to leave his side now. Mary’s courage faces up to the great risk of associating herself too closely with Jesus – at the end of the day this is why the disciples, this is why St Peter, fled so cowardly. 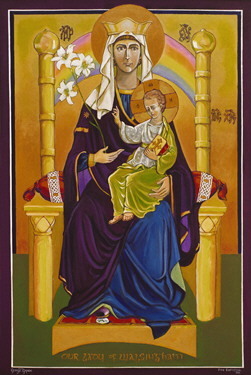 Mary’s love prevents her from leaving Calvary; that love commands her to be courageous, and so she stays watching, waiting, trusting in God, her heart filling with sorrow, accepting the words which Simeon spoke to her years before as she presented Jesus to the Temple saying, ‘a sword will pierce your own soul too’ (Luke 2:35). 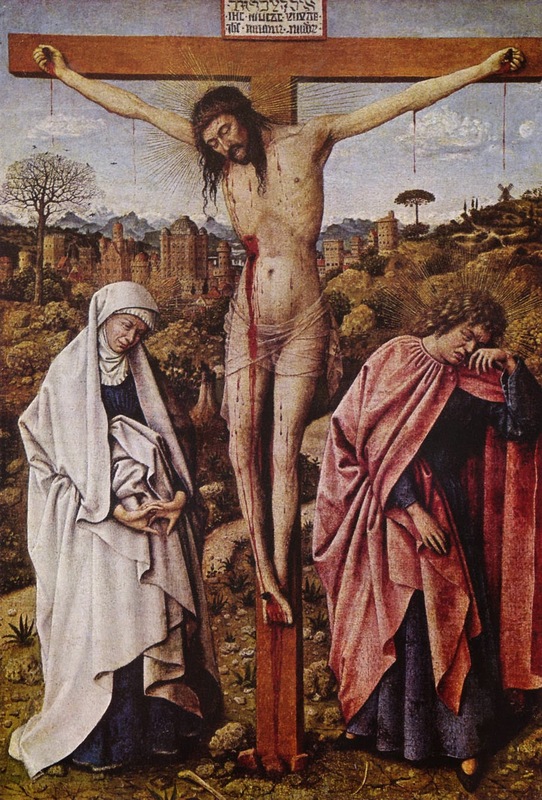 Now that that sword of pain in here, cutting through her soul, it is courage which allows Mary to stand firmly by the Cross of Jesus. Courage is that virtue that enables us to act rightly in the face of uncertainty, pain, discouragement, and opposition. Courage allows us to do the right thing come what may. The courage often shown by mothers goes a step further, and as a virtue is often commanded by love for another – unconditional, self-self-giving love for their children in the face of adversities. This courage aims to provide children with the best of whatever, great or small, a parent can give – from confronting bullies on the playground, to spending sleepless nights over revisions, to providing comfort in times of need, to working long hours to give them a better future. It is true; Mothering Sunday may be a painful occasion for those who have been bereaved, orphaned, or, even worse, abused by their parents. Perhaps, it is even more poignant for couples unable to conceive. As a priest I know put it, ‘Mothering Sunday is a pastoral minefield’. But, in a sense, celebrating together great aspects of motherhood such as courage, even with some mixed emotions, is a way of sharing with others the love and attention we have received from our mothers and a way to meditate on motherhood as a great gifts of love and devotion given to us by God.